Oppenheimer mowing down invaders. Giving zero fucks of any sort. 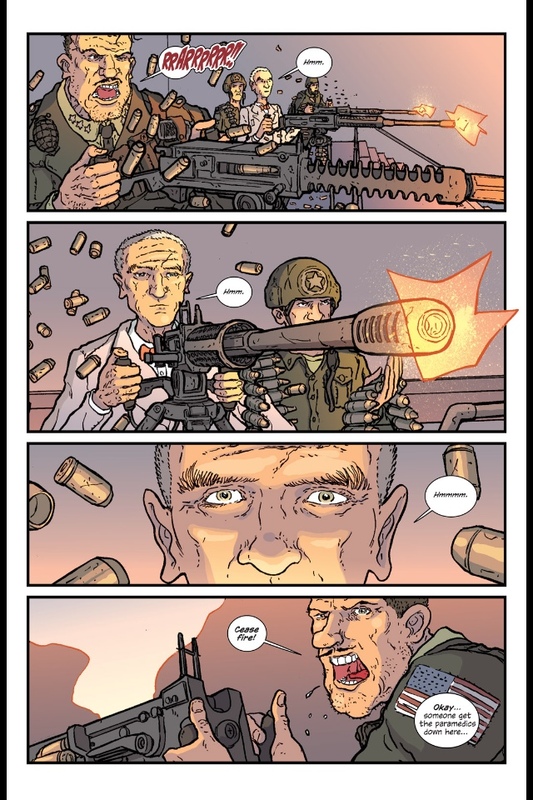 Drawn by Nick Pitarra, written by Jonathan Hickman. This comic book is batshit bananas. In high school, this is the type of comic book I would have bought the first issue of, respected its gangsta but not returned for another issue. Hickman combines cerebral plotting with visceral violence in a way that appeals to many intellectual comic readers, but I’m more of an emotional reader. This comic is good but it has no heart. That said, I’m going to likely read more issues soon because I’m not solely an emotional reader, I have grown to like the cerebral stuff. But this story needs to grow an empathetic character at some point or I won’t enjoy it in the long run. ← Don’t crash and burn.